At 1:19 a.m. I awoke to voices outside the van. “A black Mercedes,” said a man with a southern accent. A woman mumbled something back to him that I couldn’t quite make out. When my eyes finally opened I was immediately blinded by two flashlights beaming in through the windows. Thankfully, I’d attached the magnetic window screens and drawn the cab curtain before I laid down, so they couldn’t see me at all. At first I thought they might be park rangers. At Yosemite, rangers made rounds frequently to make sure campers stored their food safely in bear boxes and paid for their campsites. But these were definitely not rangers. The lights faded and the sound of crunching gravel underfoot intensified as they moved toward the back of the van. “It has Washington plates!” exclaimed the man. “That is just soooo strange,” he added. Dude, you’re the one snooping around a remote campground on a random Thursday night. Who is this guy, Giorgio Tsoukalos? When the lights and voices finally faded, I peeked around the curtain and watched the flashlights dim into the darkness toward a nearby campsite. I’d chosen to stay at the West Morris Mountain Campground in the heart of North Carolina’s Uwharrie National Forest because I was tired of staying in hotels, something that had become a necessity as temperatures rose beyond 100 degrees. But after a few days of that, I was in need of some solitude, the kind of peace and quiet that only nature can provide. While national forests are typically larger and more secluded than state parks, I’d never felt unsafe while camping in either before. Whenever I arrive at a new campground I routinely do a quick drive through to assess how full it is, if any good sites are still available, and if I feel safe. And when I drove through earlier that afternoon, only one campsite was occupied: a woman and her dog. I sat up trying to process what had just happened and I remembered seeing a man and woman pull into the campground earlier that evening, but they left soon after. And when I glanced up toward the window again, I saw a single flashlight bobbing in the distance and moving toward me slowly. But this time I was wide awake. I crouched behind the passenger seat with the curtain drawn as I watched the man approach the van. He was wearing jeans and a t-shirt, and the flashlight he was carrying illuminated his round, stubbly cheeks and dark, thinning hair. “Is there something I can help you with?” I asked brusquely through the window, which was cracked ever so slightly for air circulation. Startled, he jumped back, hobbling a little at first and then bursting into a fit of laughter. “Oh my God! Oh my God! You scared me!” he said as he continued laughing loudly. “It’s just that this…this is a black Mercedes…with Washington plates,” he said, still laughing. When he didn’t appear to be leaving I said, “Have a good night,” hoping he would take it as an invitation to leave. And he did. But I couldn’t go back to sleep. It was all so bizarre and unsettling that I knew I needed to leave, so I began searching for nearby hotels – except that when I looked up from my phone a few minutes later, I saw the flashlight coming toward me again for a third time. This time he tapped on the door. “Is there something you need?” I asked. I was pissed. “I’m sorry. It’s just that this is a black van out here…a Mercedes…and it has Washington plates…you just scared me,” he said. “Well, you scared me when you came here at 1:19 a.m. shining your flashlights in my window,” I said. “I’m sorry, I didn’t mean to bother you,” he said as he turned and left. But by that time, I had my shoes on and keys in-hand, contemplating my exit strategy. I considered briefly whether he might be under the influence, or mentally unstable. But I knew that it didn’t really matter in the grander scheme of things. It was time for me to go. When I couldn’t find any hotels in the area, I began searching for rest areas. The closest one was still a 30-minute drive, which wasn’t optimal, but it would have to do. Just as I was about crawl into the driver’s seat to start the engine, I noticed that he was headed back again, for what would be the fourth time in less than an hour. And this time he knocked loudly on the passenger door. The SOB was getting bolder now. “Hello again,” I said, not at all trying to disguise my annoyance. “You’ve done that already,” I blurted out. “It’s just that this van…out here…” his voice trailed off as he broke into laughter again. Finally, he turned to leave just as quickly as he arrived – but I was ready this time. I waited until he got halfway back to his campsite before I slid into the driver’s seat, lowered the emergency brake, started the engine, popped the van into drive, and cranked the wheel to the left – in the opposite direction of Weirdy-McRound-Cheeks. I drove toward the exit, praying the gate would be unlocked when I got there. At some campgrounds they lock the entrance at night for safety (yeah, I know), and according to their website this campground was one of them. But that would put a major hiccup in my egress plan. As I rounded the final corner of the campground loop, I breathed a sigh of relief when I saw that the gate was wide open. I hit the gas, glancing every few seconds in the rearview mirror to make sure there were no headlights behind me. For miles I drove in the pitch blackness, swerving around hideous snakes stretched out across the road and dodging dozens of deer who were clearly annoyed by the disruption. When I realized there were still no headlights behind me I relaxed a little, and an extreme sense of gratitude washed over me. I was grateful that I’d been locked safely inside the van rather than outside sleeping in a tent. I was grateful that I’d taken a self-defense class in the past, just in case. I was grateful that I had a van instead of a trailer that would have required some preparation to get it road ready before I could roll out. And I was grateful that I’d had the foresight to back into the parking space rather than pull in, making my exit easier. I smiled, imagining the man scurrying back to his campsite when he heard the van-spaceship start up behind him. I mean, had he seriously never seen a Sprinter van before? Where I lived on the West coast, I bet one in every twenty cars on the road is a Sprinter van, but since I passed Flagstaff, AZ, I doubt I’ve seen that many in total. Despite the unusual start to the morning, it still hadn’t been as frustrating as trying to find a last-minute campground or hotel in Lake Tahoe. Nor was it as unpleasant as camping next to rows of motorhomes stacked right up against each another at the one and only RV park I stayed in. And it certainly wasn’t as heartbreaking as the first night I spent in the van – in my own driveway, the night before I left the home I’d lived in for six years. No, this was definitely not how I envisioned spending the last night of my 17-day trek across the country. By then I was beyond exhausted, and the bright blue glow of the Rest Area sign was the best thing I’d seen all day. 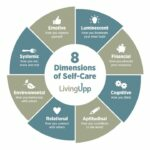 But, then again, it was only 3:28 a.m.
What safety travel tips do you have to share with the Living Upp Self-Care Community? Join and share your tips in our closed FB group, email us at Share@LivingUpp.com, or follow us on Instagram. This entry was posted in Van Life and tagged camping, vanlife.